We recently purchased Creekhaven (Dec 1st) and the amenities are in transition at Creekhaven. There were a lot of great things in place when we took over and we are evaluating what works and what needs improvement. 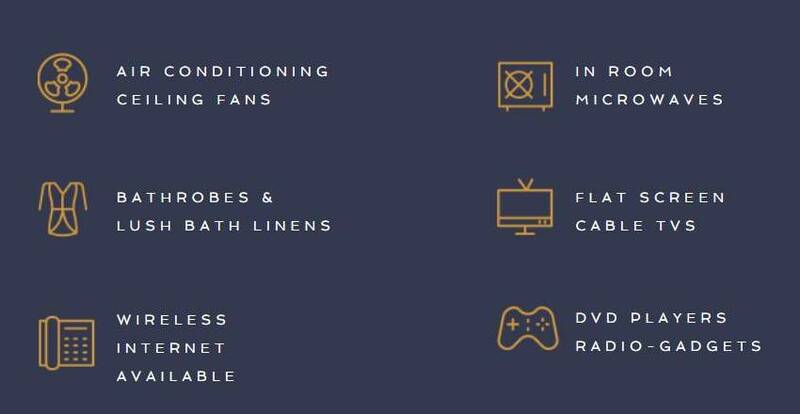 We will be adding new amenities over time and we feel like we have made some good strides in a short period. The property is beautiful and the location really can't be beat. 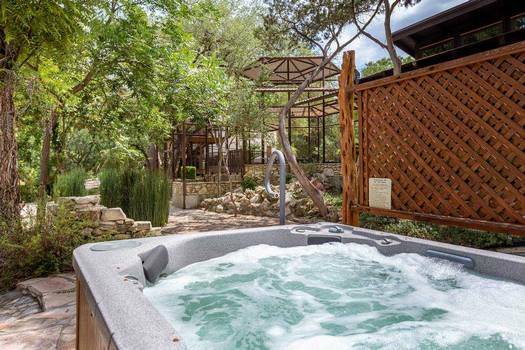 We are extremely close to Wimberley Square but when you enter the property you'll feel like it's a secluded oasis a million miles from the stress of daily life. The canopy of trees is massive and one of the Cypress tress is estimated to 1000 years old! It's a favorite spot for guest photos because it has a large opening you can stand in.. The road to Creekhaven is newly paved. We can't take credit for this but the timing is nice! It had quite a few potholes prior. We installed a property wide wireless system. It's fast and our goal is to cut cable and move to a fully streaming property. Created a dedicated spa which is perfect for couple massages. Switched to D's Roastery coffee, it's locally roasted and organic. Transitioning to higher quality linens. We will be moving to Comphy towel and sheets property-wide but we have a back supply that we are working through. 90% of the towels are new. Switching to Hummingbird Farms lavender bath products. 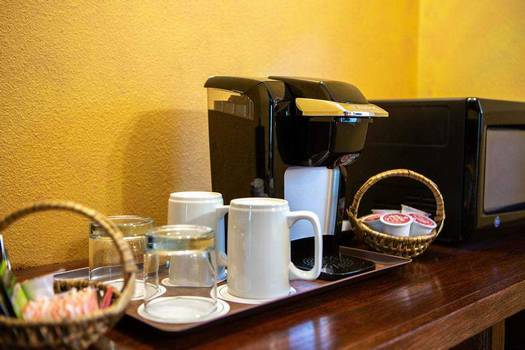 Plus a lot of subtle things that are designed to slightly improve the quality of your stay. We think if we do a lot of little things well it will add up to improve the guest experience. Here is a list of improvements currently in progress. Transitioning from septic to sewer. Not fun stuff but trust us it's an improvement. Adding digital assistant (Alexa) to rooms. This is currently in "beta testing" in a couple of rooms. We are working are way into creating smart room features. A new landscape design that will draw inspiration from English gardens but using Texas natives. Adding fun things to do while on the grounds such as outdoor games, and entertaining areas such as additional fire pits. Adding "private" creek side retreats that are designed for couples to relax together by Cypress Creek. Upgrading patio furniture throughout the property. More subtle improvements designed to want to a make you return again and again. There is so much that is amazing about Creekhaven Inn and we only want to improve upon an already beautiful property. Getting the property to the level that we want to take it will take some time and we are working very hard to achieve a level of excellence that we think our guests are looking for and deserve.  We would value your input on what improvements you would like to see implemented at Creekhaven Inn & Spa. We need to know what is important to our guests and we need input to know what we need to fix. Please be sure and let us know during your stay if there is something that needs attention immediately. We will do our best to remedy the issue. There are 8 rooms in the Main House and each has a unique floor plan, many of which are over-sized. Three of the eight rooms are suites and are quite large. These are the premiere rooms at Creekhaven. They are the Tree House, the Water Lily, and the Creek House. These are truly unique bed and breakfast guest suites. The prices on the Main House rooms vary due to the variety and range from $150 to $325/night. The Garden House is a two story building that has 8 rooms that all share a similar footprint, but each has a unique feel and design. The bathrooms are smaller than the main house but all have a jetted tub/shower combo. The exception is the Jasmine which only has a large walk-in tiled shower, which is also wheelchair accessible and is our only ADA room. Another popular feature of the Garden house is the rooms all have gas fireplaces (which are available during the colder months of the year). The Main House does not offer gas fireplaces but most rooms do offer electric fireplaces for ambiance. The Garden House Rooms are equally priced and are $175 Sun-Thursday and $190 Friday & Saturday. 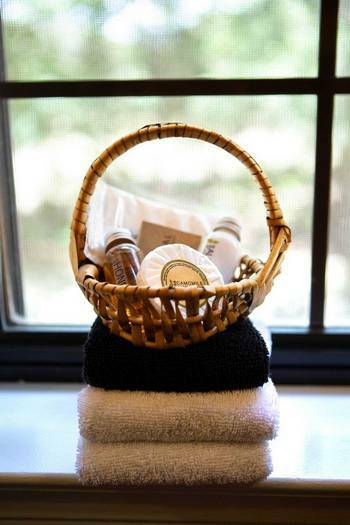 We are striving to make improvements to rooms and amenities in both buildings, but it's fair to say that the Main House is seeing new amenities first, such as the introduction to Comphy Towels and Hummingbird bath products. That said, the Garden House is seeing improvements and has had over 90% of the towels recently replaced, and 6 of the 8 rooms have new gas fireplace inserts. Private bathrooms with showers. Many with whirlpools baths, Jacuzzis for 2, or soaking tubs. Nightstand USB charger for convenient device charging. Hot Tub located in the garden area. Enjoy the wonderful night sky view while relaxing in the warm water and soothing jets of our 6-8 person tub. Hot breakfast is served buffet style. 2 night minimum required on most weekends ~ 3 night minimum on Holiday weekends. All rates are based on double occupancy – Extra Persons @ $25.00/per person. 6% is the current occupancy tax that is charged on all room rates. Billing & Deposit: A deposit in the amount of the first night will charged to your credit card at the time of the reservation. The remaining balance will be charged at the conclusion of your stay. Visa, MasterCard, Discover or AMEX accepted. Our cancellation policy requires you to notify us prior to 14 days before your arrival to prevent a charge. Cancellations received between 14 days and 2 days of arrival will not be refunded; however, we will convert your deposit into a gift certificate that can be used within 1 year of the original reservation. Cancellations received within 48 hours of arrival will not be refunded and your deposit will be forfeited. Check-in time is between 4 - 7 PM. Check-out time is 12 Noon. If you will be arriving before 4:00 or after 7:00 pm please let us know. We can try to accommodate early check-ins. Check-ins after 7 PM will be self-check-in. We will leave an envelope by the registration building that will have your room key and provide you with instructions on how to find your room. Available close to your room and on the creek side only. Please respect neighbors boundaries. Our Pet & Children Policy We love animals, and have two small children ourselves, but we have decided that Creekhaven Inn will not allow pets or children under 12. This was a difficult decision but we feel it's the right one. We hope that you understand. Boarding is available for your pets in the Wimberley area. Please ask the innkeeper for a list of available boarding kennels if needed. $25 per night, available on first come first serve basis – only 1 can be placed in a guest room. Fireplaces available in cool months. Private access to Cypress Creek, bring your towels and creek shoes to enjoy the water. Just down stream from Blue Hole open in the summer months. 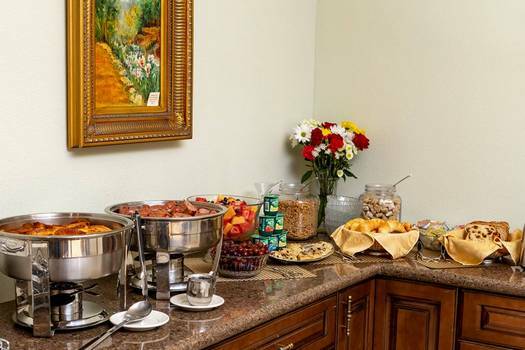 Your hot breakfast is served buffet style in the dining room. Times may vary with Inn occupancy. On weekend mornings, breakfast is served from 8:30 am to 10:00 am. On weekdays we will discuss the serving time with you. We try and limit the breakfast serving period to 30 minutes to an hour, based on occupancy. This is done to maintain the quality of the breakfast.